Government radiation test results of Coldwater Creek are missing and presumed destroyed, says the chief of the St. Louis County Health Department. Meanwhile, independent testing has forced regulators to take a second look at a contaminated site they failed to cleanup next to Coldwater Creek in the past. Records compiled as a part of a multi-agency investigation of potential radioactive contamination of Coldwater Creek during the 1980s are presumed to have been destroyed as a part of an “archival cleanup,” says Faisal Khan, the Director of the St. Louis County Department of Public Health. The city health commissioner attempted to further mollify the alderwoman by informing her that the city was conducting a joint monitoring program of Coldwater Creek with the St. Louis County Health Department. “In addition, there is an ongoing monitoring of Coldwater Creek seepage being jointly conducted by the St. Louis County Health Department and the City’s Health Division,” wrote Hope. Word that the county’s records have disappeared follows in the wake of an independent laboratory analysis last year that indicates radioactive contaminants may possibly still be seeping into Coldwater Creek near the Hazelwood Interim Storage Site (HISS) in Hazelwood. The EPA was informed by email of the independent findings in Feburary 2016. In the message, nuclear engineer Marco Kaltofen alerts the EPA — which has authority over Superfund sites — to the location and exact levels of contamination, which far exceed the agency’s permissible amounts. The email was also sent to officials at the Missouri Department of Natural Resources and the U.S. Army Corps of Engineers. Kaltofen is a member of a trio of experts that published a scientific paper in late 2015 on radioactive contamination in St. Louis County that is leftover from the Manhattan Project and Cold War eras. The other two authors of the report are Robert Alvarez and Lucas Hixson. Their research was funded by environmentalist Kay Drey and appeared in the Journal of Environmental Radioactivity. 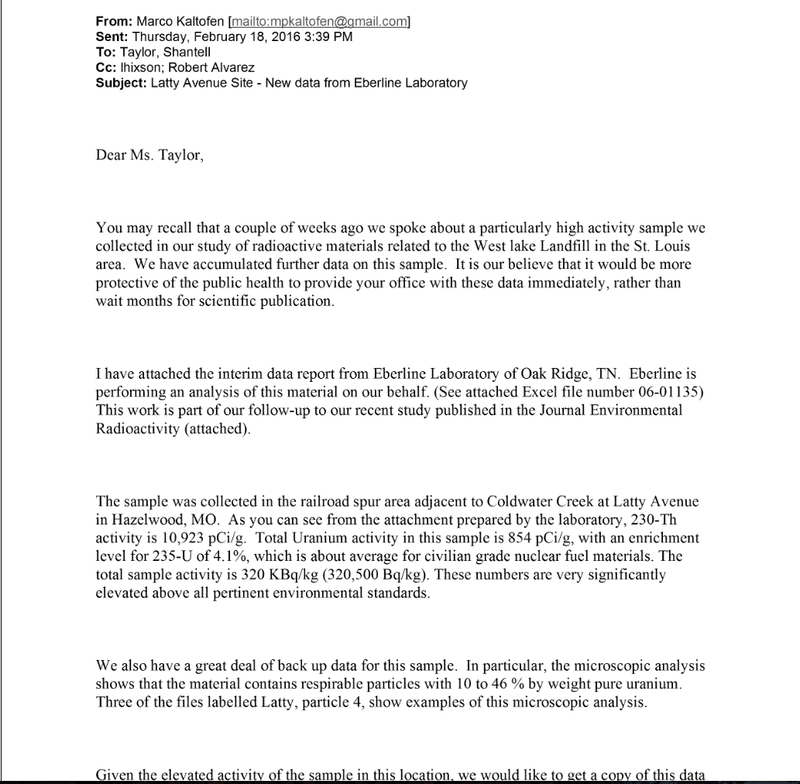 The sampling results submitted to the EPA by Kaltofen is part of a continuing independent investigation of St. Louis area contamination by the group. The site in question, known as VP-40A, had previously been tested by The U.S. Army Corps of Engineers and is mentioned in its 2005 Record of Decision. The contamination is located on railroad property that was deemed by the Corps to be “inaccessible,” and therefore exempted from the cleanup — which has been shutdown and declared completed. In late October, the Missouri Department of Natural Resources, which shares responsibility with the Corps, retested the location and said that the levels of contamination at the site match the historic record established by the Corps’ earlier testing. 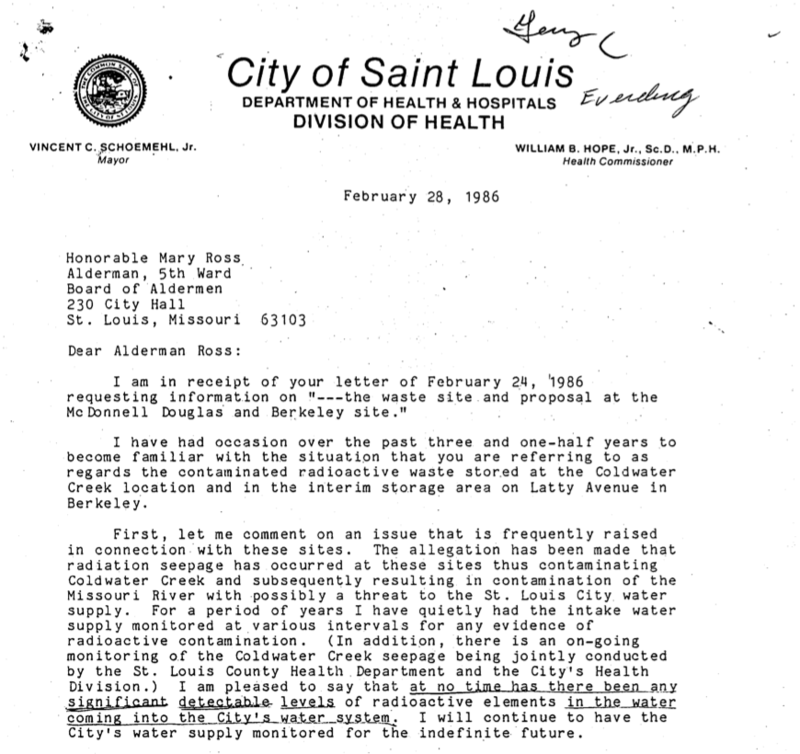 The details of the testing have been been requested from MDNR by The First Secret City, and the Corps has also been asked why the site was exempted from the original cleanup of the area, which is referred to as the Hazelwood Interim Storage Site.